Today, in honor of Charles Martin Simon’s birthday week, we present the third in a series of articles written by Charles describing his methods and approach to beekeeping. In my last article, in Bee Culture, July 2002, Fundamentals and Finesse of Structural Bee Removal, I covered trapping bees out of their nest without taking anything apart or cutting into anything, my favorite way to go. But sometimes you can’t do it that way. The usual problem is time. The property owner needs them out right now. They’re remodeling, re-roofing, having a party on Saturday, something important, and everything is stopped until the bees are out of the way. When this happens, the building must be taken apart and the bees physically removed. This type of removal is the more difficult and dangerous. 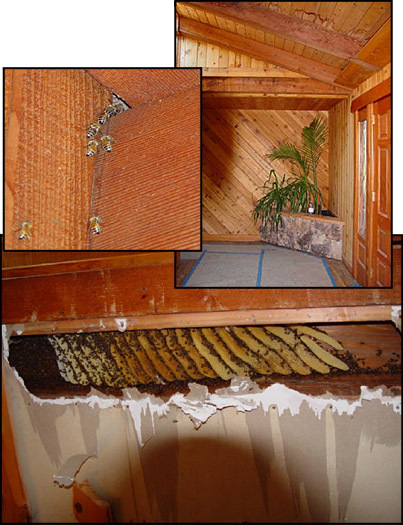 The dangers occur not so much between remover, structure, and bees, although they are there to be sure, but between remover and property owner. When you take a person’s house apart, they just might get picky – later on, after the thrill of having their demons exorcised wears off, and they have to face the realities of reconstruction, or if it’s already been reconstructed and it just doesn’t look right. I spoke with Roger Stark, an insurance man well-versed in bee-related issues. He told me removers were being sued for 50 and 60 thousand dollars! Now these are fellows who have done nothing wrong. They have performed the job exactly as agreed, but for one reason or another, the property owners have become disgruntled. Good advice, but I am not going to take it. I survive on bee removal. I’ll quit removing when they pry my removal tool out of my cold, dead fingers. So I consulted with my good friend, a venerable and distinguished lawyer. I asked him whether a “Hold Harmless” clause might not be a good idea in the contract, something like the doctors make you sign before they start cutting you up. He said no, such clauses are unenforceable. If the party wishes to sue, they do it anyway, regardless of what they might have signed. So, if you’re an experienced bee person, self-employed with no attachable assets, you might go for it. But the best advice is don’t. A clearly spelled out agreement in advance on paper, duly signed by both parties, remover and property owner, might provide some ammunition for avoiding trouble later on, albeit not all that powerful. In this country, in order to be legal, all construction must be performed by a licensed contractor. So, if you already happen to be a licensed contractor with insurance and a beekeeper at the same time, you’re perfect for the job. Otherwise, you might consider getting a contractor’s license, if you’re young and ambitious. I am too old and not ambitious enough. I just want to survive and keep doing what I’m doing, what I know and love, removing bees. A few years back, I spoke with a yellow jacket man who was facing jail time. The oh so intelligent judge declared the man’s vacuum apparatus to be a pesticide – because it was being used in the extermination of bugs. Yes, I know this is not bee removal, but it does speak to the trouble you can get into just based on a judge’s interpretation. The yellow jacket man was being persecuted by the pesticide people. And the judge, being totally in bed with the pesticide boys, ruled that my man, since he did not have a pesticide license, was to cease and desist immediately. My man refused. Yellow jackets were his life, removing them his livelihood. The judge declared him in contempt, and when I spoke with him, he was waiting to see what his sentence was going to be. He was scared and uptight. “Why’d you wanna go and do that for?” he’d want to know. “So I could remove a colony of bees from inside the wall,” I’d reply. “You mean bees? Like what sting you?” he’d ask, starting to become impressed, maybe just a little bit incredulous. “Exactly,” I’d say. His face would darken then in puzzlement. “I like bees,” I’d say. “But they sting you,” he’d say. “I like getting stung,” I’d say. At which point, the fear would take him over, and he’d decide to go look for someone a little less crazy, a little less tough. Beekeepers are among the toughest people in the world. Bee removers are even tougher than that. Or maybe you know a contractor you can work with. Or maybe the property owner already has a relationship with a contractor, and you can work together. Have the contractor open the space (You can lend him or her a bee suit and stay with the operation so things don’t get out of hand. 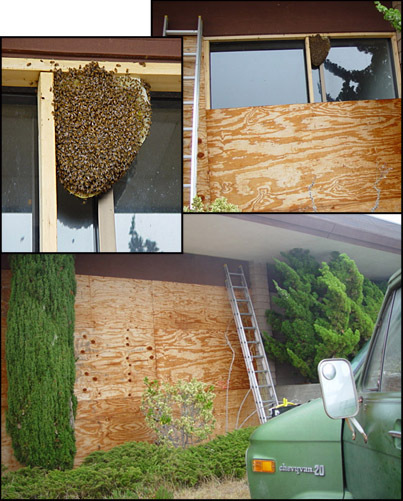 ), then you remove the bees, then the contractor restores the property. Removal is a sticky job. It’s at its worst when you work directly over your head, and you often have to. Expect to be showered with honey. It would be a good idea to have a few extra suits, hats, veils, and pairs of gloves handy. Getting honey all over yourself could be a good thing, but the problem is it spreads to everything you touch. You don’t want it on the steering wheel of your truck, the door handles, all over the seat, etc. You have to have a water source at the job. If there’s none, bring it with you. Because you’re going to have to frequently wash yourself, your clothes, gloves, and tools. I do prefer to be involved in the rebuilding process, for the simple reason that contractors, not being bee people generally, are liable to make mistakes resulting in reinhabitation by the bees in the future. In fact, it is mostly due to the mistakes of contractors in the first place that we have bee-ins, a common one being the use of quarter inch mesh instead of eighth inch in vent holes. It’s almost as if the contractors were trying to give us jobs. I remember one I did in a Victorian house, a summer beach rental owned by a major hotel. The contractor who put it back together failed to seal it up properly, and the bees were back the following year. That time, I confess, I executed the forbidden reconstruction myself, in flagrant violation of all contractor contract and permit clauses, but the bees haven’t been back since. It’s been 10 years at least, so the Statute of Limitations has expired, and I am in the clear as far as that one goes. I am conscientious about my work, and I take many risks for the benefit of my clients. Session 1. Deconstruction. The minimum necessary to get at the bees. Performed by a licensed contractor of course. It’s never as easy as it looks. Nails don’t come out clean. Boards don’t come off in one piece. Sometimes the nest is not where you thought it was. Or it meanders around joists, and you run into trouble. Or it’s in the wall right where you expected it to be, but it extends off to between the floors or into the ceiling or attic. There are infinite configuration possibilities, and each presents a unique set of problems to overcome. A. Cut out brood combs and tie them into frames with soft cotton string. Place frames in a hive and add the bees from the cavity. This is messy and often painful (You have to take off your gloves to tie the strings which are sticky and uncooperative, and you know what that means. ), and likely to be unsuccessful. It’s best if you can leave the new hive at the site, as close to the cavity as possible, for a few days until the bees get reoriented. Otherwise, take it to the new location, bring the bees to it and add them. Depending on such factors as season, it might be better to add the brood combs to an already going hive that could use some more brood and the bees to a hive that could use more bees, rather than trying to keep the removed colony intact. B. Use a vacuum to separate the bees from the combs. Every remover should have a bee-specific vacuum apparatus. 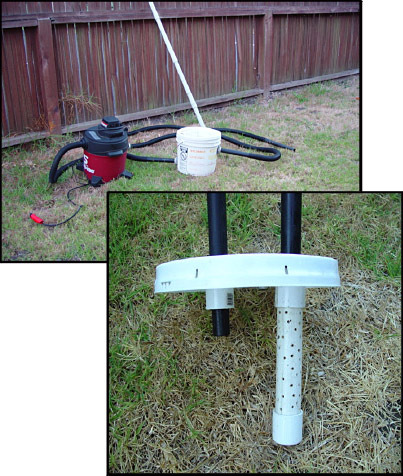 I use a 5-gallon Shop Vac, running the suction tube into a sleeve fixed to a five-gallon plastic pail perforated with air holes which I tape to provide suction, leaving some holes open to fine tune it. Too little suction and the bees don’t get sucked properly, too much and they get damaged and die. Afterwards, I remove all the tape to provide plenty of air. The tube that goes to the Shop Vac is attached to the pail via a screened sleeve so the bees are not drawn into the machine but rather left nicely in the pail. Combine bees with an existing hive. Separate combs suitable for human consumption. Feed those not suitable back to the bees. Give good brood combs to an existing hive. Session 3. After allowing a day or so for the left over bees to cluster, remove them (the vacuum again) and add to hive. Scrape cavity clean. If many bees are flying during Session 3, a fourth session will be required. I usually allow at least a full day between sessions. Of course, to round up left-over bees, it’s best if you go very early in the morning, at dawn. The job is done when there are no bees left, and the cavity is as clean as possible.